We all know people who excel at things that the rest of us find difficult or impossible. They’re the ones who are born with the co-ordination to play a blinding round of golf, the drive to become a city whizzkid, or the metabolism to get into amazing shape with minimum effort the very first time they step into a gym. While the rest of us have to put serious amounts of work in to get anywhere near our goals, our lucky counterparts are born with the necessary requirements to get ahead without even breaking into a sweat. The racing world is a bit like that too. While exquisite, unique WSB and GP bikes need hundreds of thousands of pounds and hundreds of man-hours to make them competitive, and Supersport bikes are heavily breathed on, too, the rules governing the work and changes allowed to Superstock are so strict, every model on the grid has to be a virtual track champion from the moment it leaves its packing crate. But for all their lack of tuning, tweaking and bolting special bits on, Superstock bikes lap circuits in times that are up there with the best of many of the " purer " classes. And they breed household name champions too, like Suzuki-mounted Karl Harris, who cleaned up in European Superstocks in 1999 and is now better known for his outstanding performance in British Supersport. Another champion we’ve heard less of so far, but who is destined for a brilliant career in racing, is James Ellison who, at the age of just 20, has just become the overall European superstock champion on his Hi-Peak Racing-backed Suzuki GSX-R1000. So he’s the perfect man, therefore, to help me test and evaluate a trio of top British superstock machines – the British superstock championship-winning GSX-R1000 of South Essex Performance-backed Paul Young, Glen Richard’s Honda FireBlade and the V&M Yamaha R1 ridden by David Jefferies. Aside from the fact neither Ellison or I have been to Cadwell Park for years, we have little else in common. I’m quick, he’s devastating. He races, I do trackdays. I’m happy using 80 per cent of the bikes’ performance, he demands every last ounce. As I watch Jefferies and team-mate Matt Llewellyn, who are doing a little private testing and lapping of Cadwell’s short circuit in seemingly impossible times, the nerves begin to set in. While I might be at the front of the fast group on a trackday, I’m firmly at the back of the grid in the company of these guys and I don’t want to get in their way. I also don’t want them catching me unawares. It’s hard enough holding onto 150bhp on a circuit that’s only just big enough for minimotos without having the added complication of being some world-class racer’s mobile chicane. Ellison, meanwhile, sits motionless, watching every move from his vantage point near Cadwell’s hairpin. He’s completely unfazed by rapidly shifting traffic. He’s totally used to it by now. All he’s thinking about is riding the bikes. He’s curious about how other Superstockers perform. While they’re unlikely to make more power than his, their suspension is set up completely differently. Adapting to the individual tastes of Young, Richards and Jefferies will be Ellison’s toughest task. Jefferies and Llewellyn come back to the pits, so I wander over to meet them.
" Right chaps, I don’t want to show you up, so you’d best stay out of my way. " Young has fully warmed his GSX-R up. Ellison plumps for it first. I take the FireBlade. We both wobble round the Lincolnshire circuit, which is surprisingly dry and warm considering it’s November, for a few laps. Ellison shows me his turn-in points. A couple are quite a bit deeper into the corners than mine and I resolve to follow him blindly for the next few laps until I’m comfortable with them. The Blade is behaving totally predictably – like the stock road bike, only slightly crisper, a bit more powerful and a couple of kilos lighter. I’ve always loved Blades. First they redefined the litre bike class when they appeared in 1992 with the dimensions of a 750 and the power of a good 1100. Then they fought off every manufacturer’s challenge until, in 1998, the R1 was born. That bike – the best Yamaha has ever built – rightly caught the public’s imagination and the shift in sales volume began to move away from the Honda. But as Yamaha’s staff admit, many owners simply found the power too much – and promptly sold their R1s, sometimes with as little as 1000 miles on the clock. In moving the litre class on so much, Yamaha set a boundary that met or surpassed the personal " big balls " limit of many buyers. But FireBlade owners, found themselves onboard a more refined machine with better, more predictable table manners. Blades don’t burp or belch over white lines and overbanding, R1s do. Of course, then the GSX-R1000 turned up then, and delivered even more power, a super-sharp chassis and wicked handling, too. But it is utterly manic. As Ellison picks up speed on the Gixer, I’m getting more of a feel for the Blade and already have a good idea about how the bike will perform once we’ve re-familiarised ourselves with the track. We pull in, Ellison jumps on the R1 and I take the GSX-R. The transformation is amazing. The Suzuki clearly has more potential than the Honda but it demands a lot more work and input, too. After a couple of laps, I’m confident I can find my way round the track at an OK pace. Just to make things fair, we pit again and I jump onto the R1, while Ellison gets the Blade. Jefferies and Llewellyn, happy I won’t be grasstracking in pursuit of a decent lap, join us back on the circuit, wheelieing their tricked-up developmental F1 bikes halfway round the first corner and away up the hill. I chuckle at the sight, marvel at their poise and ability and thank whoever that I’m not on their machines. The superstock bikes are a handful around here but 160kg, 180bhp nutcases? They’re a different story. As I watch the slicks of Jefferies and Llewellyn spin up as they disappear from view into the second right hander, I think about how much road tyres have come on lately too. Superstock bikes, with up to 150bhp, are shod with treaded rubber. And while it’s super-sticky, it’s also road legal, which means it has to have an acceptable degree of compliancy in the sidewalls, be safe and predictable, warm-up quite quickly and wear out at not too mad a rate too. A blend of all these characteristics was barely available at racing’s top level just seven or eight years ago. I’m not intending to go so fast I’ll run out of grip or ground clearance, but Ellison clearly is. He’s hared off at a similar pace to Jefferies and Llewellyn and is effortlessly pulling yards out on me. Though we’re due to pit again, it seems that the start of the test proper is here. The R1 is superbly set-up and feels like a factory-prepared race bike. The motor belts out great globs of torque, making the front end very light exiting some bends. It’s particularly lively heading for the first left after the hairpin and the head shakes a couple of times but it’s much milder than the steering damper-less road bike, which shimmys and slaps in these conditions. To get the most from the R1, it needs to be grabbed hard and bullied into performing well. Several roadtesters, including MCN’s superquick Kev Smith, have previously told me that they think it’s a bike best suited to heavier, bigger, stronger people. And that may explain why burly Jefferies does so well on every derivative of an R1 he ever climbs aboard. Ellison later agrees that my feelings about the R1 echo his. He said: " It’s very well set-up and very well built. Everything feels solid although I didn’t feel I had much control over the front end exiting turns. There’s lots of torque and that made the front very light.
" I thought the power would carry on but it felt like the limiter came in 2000rpm too early. The R1 accelerates really strongly, is smooth and consistent and it just didn’t give the impression you were going fast even though you were. " He wasn’t such a fan of the brakes, though. He said: " They felt quite wooden and didn’t have as much bite as the Blade or GSX-R’s assemblies. But the chassis makes up for that. The bike steers very quickly because there’s masses of rear ride height and a heavy rear spring.
" Changing direction was easy and I could carry high corner speed. The set-up lacked a little grip when I wound the power on but at least the result was easy to control. " The GSX_R was next up and I struggled to get my head round its set-up. The rear spring was so soft and the ride height so low that it felt like a chopper – a tall front end and a squashy arse. That made it more difficult to turn than the R1 but helped the rear tyre soak up the power and reduce slides. Unfortunately, it also made wheelies all too easy and the GSX-R kept lifting its front whenever the power was wound on in first, second, or third. Short-shifting seemed to be the only way to keep both wheels on the deck. Ellison echoed my thoughts. He said: " Young’s bike seemed to be set up very differently from mine. The back was sat down low for lots of grip exiting corners and stability on the brakes and the forks were unbelievably stiff to reduce dive and allow more aggressive braking.
" It was very difficult to steer at first. I found I had to slam on late to make the forks dive far enough to actually be able to apex at the right place. " 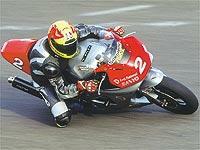 But it’s very well engineered for Young’s own riding style, which is why he won the title. And the brakes were awesome with loads of bite. They felt like they worked the discs very hard. " Which just leaves my personal favourite – the FireBlade. Like I said, it’s the easiest to ride. It’s also arguably the fastest lapping bike in the hands of non-race gods. Three of my mates who were brought up on a diet of Blades swopped to R1s when the Yamaha first appeared. They’re all fast riders, effortlessly lapping within a few seconds of several tracks’ lap records. And, guess what? They’ve all gone back to the Blade. As one put it: " It’s not like Honda can’t build a Blade with the power to rival an R1 or GSX-R1000. The decision to keep everything in check stems from Honda’s simple philosophy of making a bike a complete package. That’s why I love Blades and why I’ll never change. " Those words hit the situation perfectly on the head for me. And while Ellison might not echo the sentiment exactly, he was impressed with the bike. He said: " The Blade is loads of fun. It’s very easy to throw around the track, felt lighter than the Suzuki and more forgiving and, if you went in too hot you could just dab the back brake and let it drift sideways in to the corner. That was a lot more difficult on the other two bikes, partly due to the seating position. The GSX-R felt like I was sat in it, the R1 was like I was sat on it.
" The brakes were very good. I felt a lot more confident trailing them right to the apex and it felt like you could push the front more and run hotter into the turns.
" The engine lacked the initial grunt out of turns that the Suzuki and R1 had, but the bike was surprisingly quick once it got going.
" It was very stable exiting turns, probably due to the comparable lack of torque.
" This was also the only bike that would pull top- gear at the end of the main straight without revving its nuts off. " Yeah, okay James. The only time I got into top was when I shifted one ratio too many by mistake….